Establish Maturity and Capability Improvement Target (Level 3). Managing the Enterprise Architecture to the Next Maturity Level. A standard methodology enables a stable state of maturity development to be reached and for incremental improvements to be made over time. Increases an organisation’s capability for Enterprise Architecture. 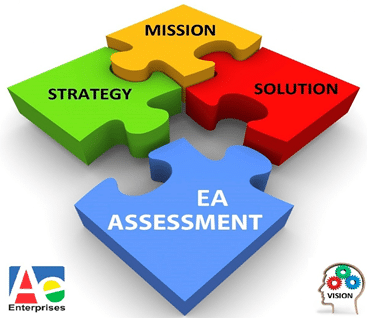 Successful EA programs are viewed as critical to business sustainability. Gives an indication of compliance with governance policies and procedures across the enterprise. Thus giving key stakeholders an early indication of governance issues. Financial benefits can be derived from reduced redundancy, improved time to delivery, reduced support costs and reduced acquisition costs. Our consultative approach involves all stakeholders and ensures that the focus for improvement is in-line with your key business drivers to deliver real and measurable business benefits. Project 1: Baseline Architecture Capability Maturity Assessment. Deliver an initial Architecture Capability Maturity Assessment. This approach produces a view of your current capability for Enterprise Architecture. A number of interviews will be conducted and will incorporate stakeholders, senior management, business owners, architects, etc. The output of this module is an architecture capability score on your current architecture with documented analysis. An informal review of the initial findings will be discussed with the core team. This project establishes the organisations objective and targets for maturity and capability improvement. A consensus workshop provides a vehicle to produce an objective view of the report provided in project 1. This gives you and your senior management team a detailed view of how well Enterprise Architecture is deployed in your organisation, provides a full understanding of your business drivers and organisation issues and a clear view of where you want your organisation to be. The output of this project is an agreed action plan that is agreed, prioritised and understood by the key stakeholders in your organisation. Project 3: Managing the Enterprise Architecture to the Next Maturity Level. Leading on from the Project 2 this project provides a mentoring and consultancy service using best practise tools and techniques to address the maturity and capability improvement projects scoped in Project 2. In this program we can also provide a principle consultant architect to lead a team to implement the activities agreed in module 1 & 2. A program manager can be assigned to drive the project deliverables and highlight risk areas. The following steps are areas that could be addressed and are not an exhaustive list. Project 4: New Maturity Assessment. The conducting of regular scheduled assessments from experienced consultant(s). These assessments may take place initially as often as every month but then move swiftly to every 6 months once the Enterprise Architecture Road Map’s goals are successfully being achieved. This will provide the client with a roadmap for the next period (3 or 6 months). ATE Enterprise’s Architecture Capability and Maturity Assessment service covers 20 process areas with associated practices that are required in an architecture practice that utilises TOGAF as a framework. To cover the additional areas requested in the business objective work is required to define the processes, practices and measures.